The nasopharyngeal (NP) endoscope comes in different models; a common one is the Karl-Storz brand that was used to make the videos below. 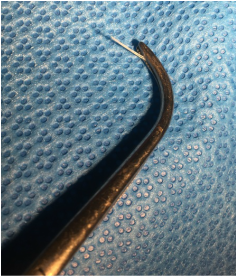 Unlike its 60cm counterpart, this 30cm NP endoscope is not long enough to intubate. There are a variety of provider-dependent approaches to the NP scope, but here I'll describe some relatively easy tips for preparation and technical use. As with any procedure, thoughtful preparation will improve your chances of success. For NP endoscopy (or any awake airway), this depends on thorough topicalization. 1. Oxymetazoline (Afrin) is a topical vasoconstrictor that can improve nasal passage caliber, prevent epistaxis, and reduce mucosal secretions that block or dilute topical analgesics. Help your patient sniff Afrin 0.05% solution into each nostril 2 to 3 minutes before application of local anesthesia. 2. Lidocaine is the most readily available topical anesthetic agent in most EDs. Concentrations of 2% to 4% are optimal. For topical anesthesia of the upper airway, atomizers are more rapid and effective than nebulizers. Atomizers produce larger droplets that are more likely to be absorbed by the upper than lower airway and can quickly direct a large amount of anesthetic to a mucosal target. I also ask my patients to gargle a few mL of viscous lidocaine to numb the paraglottal areas. 3. Local analgesia should be all that most patients require to tolerate nasopharyngeal endoscopy, but in your more anxious patients consider also a small dose of midazolam. To select the nare through which to advance your scope, ask your patient to plug one nostril and breathe through the other. Choose the nare feels least obstructed; this might help to avoid edemetous turbinates or other potentially obstructing anatomy. Your first obstacle on entering the nasopharynx is the inferior turbinate. This and the septum are highly innervated and vasularized areas, and bumping into them can be painful and cause bleeding. Slip between them along the floor of the nasal passage. Here is a nicely topicalized nasopharynx. The operator is able to advance along the nasal floor between the inferior turbinate on the left and the septum on the right. In this seperate case, the patient was only given nebulized lidocaine. Secretions and blood obfuscate the camera and the patient could not tolerate the procedure. Curving inferiorly, the glottis will come into view. When looking for a foreign body, there are a couple tricks to expose and interrogate the paraglottal regions. Ask your patient to say 'eeeee'; this brings the vocal cords together and exposes the space behind the aryepiglottic folds. To expose the vallecula, ask the patient to stick out his tongue. Alternatively, you can grasp the tongue with gauze and pull (gently) forward.